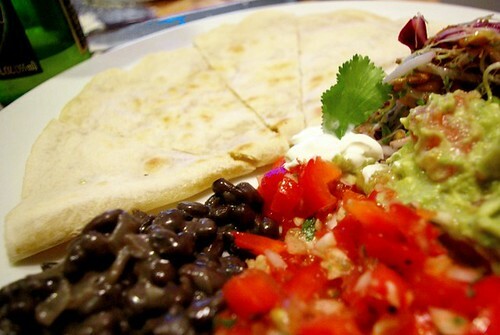 san jorge and habenero cheddar quesadillas with spicy black beans, fresh salsa, guacamole, and beansprout 'slaw, originally uploaded by aarn! +13th April, 2009+. this was a collaborative effort at the house. maddie and nic made some guacamole, spicy black beans, and an interesting bean sprout 'slaw with red cabbage and a nice light dressing. don't have much more info on what went into those. trisha made a similar salsa to some previous posts, laden with fresh cilantro and finely chopped onion. made some fresh flour tortillas. mixed 1 1/2c. flour, 1/4t. salt, 2T. butter, cutting in the butter until mixed. then added 1/2c. warm water and worked until about the consistency of a wet bread dough. the dough was then rolled into a ball and allowed to sit for a few minutes. it was then cut into rounds and rolled out into six 10-inch tortillas with a french rolling pin. a large frying pan was warmed over medium heat, lightly wiped it with vegetable oil, and the uncooked tortillas were filled with cheese, folded, and then placed in the pan until each side had nice coloring, was crispy, and the cheese was obviously melted. quesadillas were plated with all of the fixin's and a little sour cream, and washed down with some dos equis lager and amber beahs.